Project 2340: R. A. Stockey,G. W. Rothwell,K. R. Johnson. 2016. Evaluating Relationships among Floating Aquatic Monocots: A New Species of Cobbania (Araceae) from the Upper Maastrichtian of South Dakota. International Journal of Plant Sciences. 177:706-725. •	Premise of the study: A large number of fossilized floating aquatic aroids have been recovered from pond sediments in the Hell Creek Formation (Upper Cretaceous) of Harding County, South Dakota, providing valuable new data from which to characterize aquatic vegetation of the uppermost Cretaceous, to describe a new species of the genus Cobbania, and to evaluate both the relevance of associated reproductive structures and the phylogenetic relationships among floating aquatic monocots. •	Methods: Specimens on split surfaces were uncovered as needed with fine needles to reveal surface features of the specimens. Images were captured with a digital scanning camera, and phylogenetic analyses were conducted using TNT implemented through WINCLADA. •	Key results: The new species, Cobbania hickeyi Stockey, Rothwell & Johnson extends the range of the genus to the uppermost Cretaceous, supports the taxonomic integrity of the genus Cobbania, and increases our understanding of structural variation and species richness within the genus. Associated reproductive structures include an aroid spadix strengthening the assignment of Cobbania to the Araceae. A phylogenetic analysis of morphological characters supports earlier results from morphological analyses about relationships among floating aquatic aroids, but the fossil taxon Aquaephyllum does not nest among the floating aquatic species. 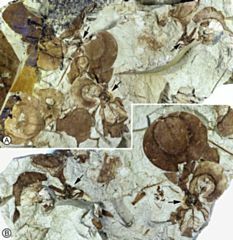 •	Conclusions: Species of the genus Cobbania were an important component of aquatic vegetation during the Late Cretaceous. A test of competing hypotheses for relationships among Pistia stratiotes, Cobbania spp., and species of Lemnaceae Lemnoideae indicates the results from analyses of morphological characters continue to contradict those from the analysis of nucleotide sequence characters.